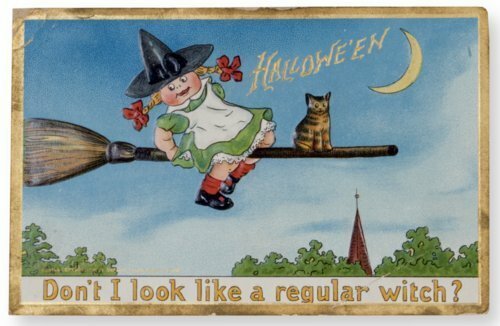 Embossed Halloween postcard copyrighted by Raphael Tuck & Sons of England. Lithographed scene depicts girl and cat seated on a flying broom and poses the question, "Don't I look like a regular witch?" One-cent postage stamp on reverse, plus a handwritten message indicating the postcard was sent to the donor, Edith DeMoss, by her sister, Margaret May. It references two different Halloween parties in the Iola, Kansas, area. Creator: Raphael Tuck & Sons Co. Ltd.